What other measures should I take to ensure weather tightness? Exterior frame weatherstripping is an important item in weatherproofing a garage door. For this purpose, a double-lip weather strip in arctic vinyl is the most efficient. Also analyze the weatherstripping between each door section. Does it feature a true thermal break? What type of weatherstripping comes with the door? If your door is exposed to strong winds, does it feature weatherstripping installed on the top of the door? What about section ends? 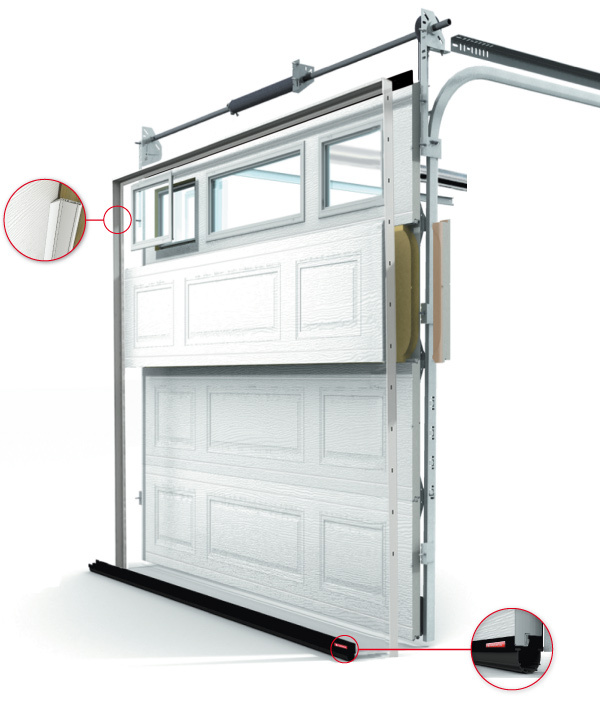 Does the door come with steel end caps that form a thermal bridge, transferring cold to the inside of the garage? Even if your door is insulated with polyurethane, if there are several thermal bridges, the door’s insulation won’t be very useful. If your weatherstripping do not respond to those expectations, contact us or get a free quote.